Sigma has garnered praise for the Canon EF-S mount version, and now the Japan-based optical company has released the lens with a Nikon F mount for use with DX format cameras. It maintains the same optical formula as before and includes 17 elements in 12 groups with five low dispersion glass elements and four elements with aspherical surfaces to reduce aberrations while keeping the lens as small as possible. It has an equivalent field of view to a 27-52mm lens and uses and ultrasonic type AF motor for near silent focusing down to just 28cm. Inevitably for a high-speed model like this with a 72mm filter thread and measuring 121mm front to back, the lens is a fairly weighty 811g (1.78 lb) At a not unreasonable $799, the lens is back-ordered in Nikon mount but availability is slated for November 21. 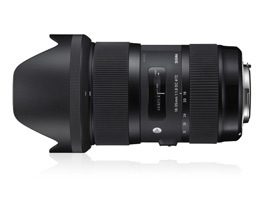 When mounted on the 24-Mpix D7100, the Art series Sigma 18-35mm f1.8 DC HSM A is the best performing zoom in our database. 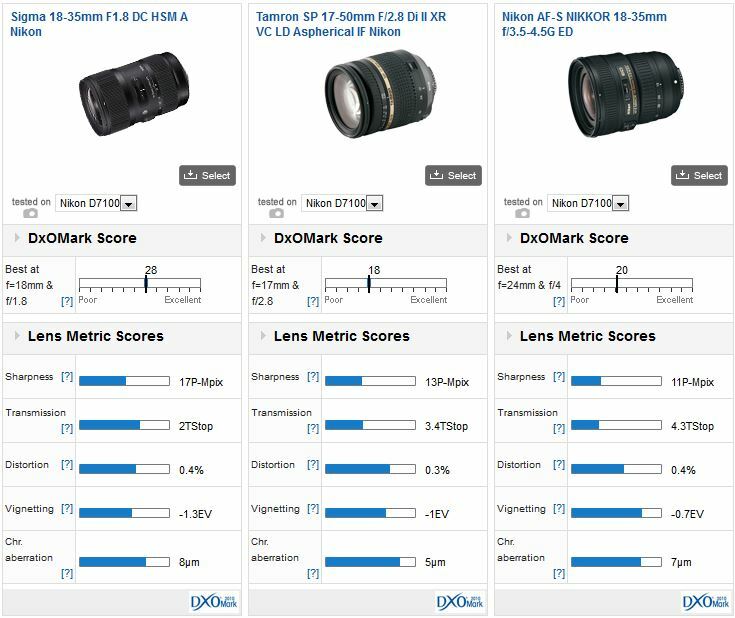 With a DxOMark score of 28 points it leads by quite a margin, not only is it well corrected but also the high-speed design permits increased illumination of the APS-C sensor and is an important influence on image quality. However, in terms of peak sharpness it rivals lenses such as the firm’s DX format 50-150mm f2.8 EX DC APO HSM model and the Tamron SP 70-200mm f2.8 Di VC USD. When benchmarked against current standard zooms, the high-speed Sigma stands out even against the firm’s respected 17-50mm f2.8 EX DC OS HSM model and other premium-quality zooms such as the $1329 AF-S DX Nikkor 17-55mm f2.8G IF-ED and newer full-frame AF-S Nikkor 16-35mm f4G ED VR. 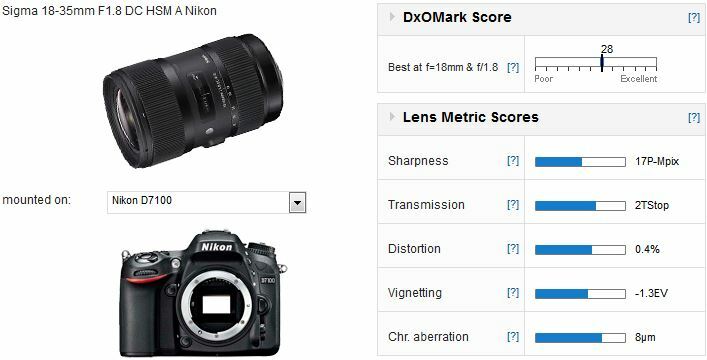 On the 24-Mpix D7100, a camera noted for its high resolving power, the Sigma achieves a very high 17P-Mpix score only matched by the current Sigma 50-150mm f2.8 model and is very sharp centrally at maximum aperture at all focal lengths. Not only that, but uniformity of sharpness is very good at full aperture, deviating by less than 7% percent across the frame. Peak performance is at f5.6 with edge-to-edge sharpness throughout the zoom range. Distortion can be a problem in zooms like this but while some barrel distortion is noticeable at 18mm and slight pincushion can be seen at the longer end it’s quite mild. Both vignetting and chromatic aberration are also low, though, surprisingly, CA is more conspicuous in the corners at 24mm than at 18mm. 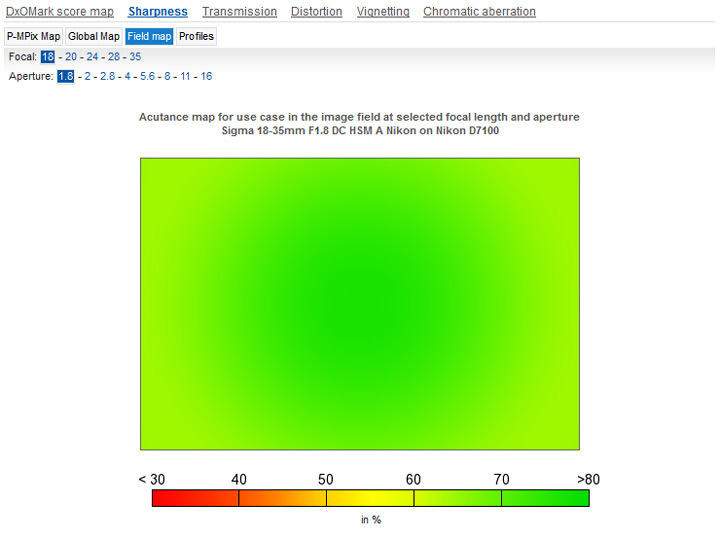 Also worth mentioning is the excellent, mostly consistent 2TStop transmission measurement at full-aperture. The Sigma is very sharp at full-aperture and not only at 18mm (as shown above) but throughout the zoom range. After the critical acclaim of the full-frame 35mm f1.4 HSM, the firm achieved a similar level of success with the intriguing APS-C only 18-35mm f1.8. The Nikon mount version reviewed here replicates the same high performance of the earlier Canon mount version, and while the same minor criticisms apply regarding the slightly short zoom range (equivalent to 27-52mm) and weight, the Sigma 18-35mm f1.8 DC HSM A remains an outstanding example of what’s achievable with modern lens designs. And at $799, it’s reasonably accessible in price as well.